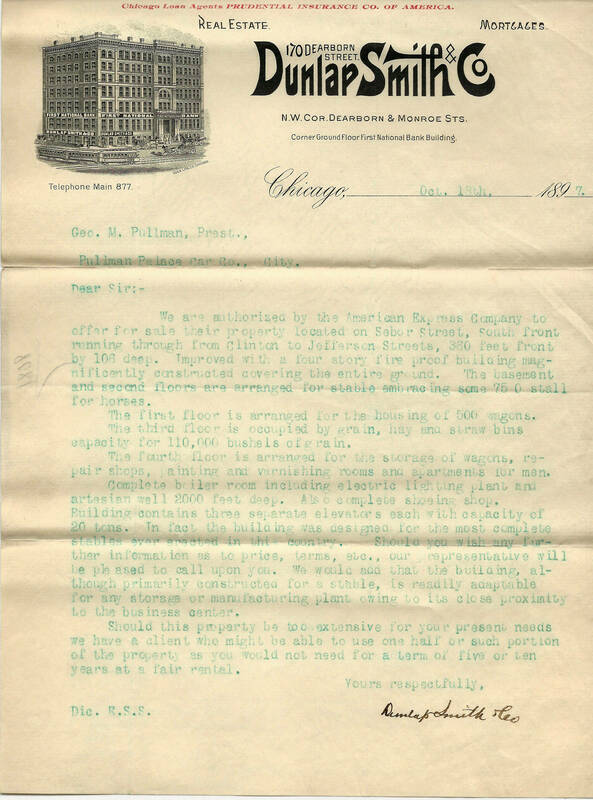 Letter from Dunlap Smith & Co.
Letter to George Pullman offering Pullman American Express Company property on Clinton & Jefferson in Chicago...building outfitted for 750 horse stalls, 500 wagons, 110,000 bushels of grain, shoeing shop, 20-ton elevators. Title Letter from Dunlap Smith & Co. Description Letter to George Pullman offering Pullman American Express Company property on Clinton & Jefferson in Chicago...building outfitted for 750 horse stalls, 500 wagons, 110,000 bushels of grain, shoeing shop, 20-ton elevators.